Over the past week, my Nissan Juke has been an unstoppable force in the mix of ice, sleet and snow. I recently wrote about the various drivetrains of various vehicles, a result of dealing with an early winter storm. The storm has since moved east, but it remains unseasonably cold out. It was 11˚F this morning. A few minutes after I arrived at work, my wife Abby called, pretty upset. The heat in her 2010 Nissan Frontier pickup, one of the vehicles I talked about last week, wasn’t working. I got a ride to her office and brought the Frontier to the local Nissan dealer. Four hours later they called to say that it had gas and needed to be burped. There was air in the coolant lines. After burping, the heat worked just fine. 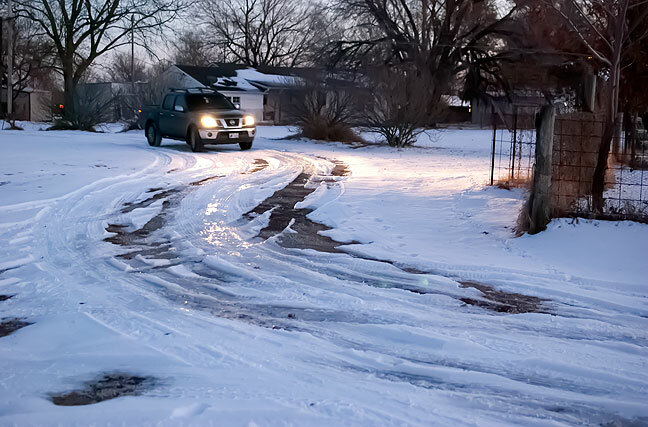 With some snow and ice still covering roadways, I left her drivetrain set to four-wheel drive mode. As I made my way back to Abby’s office, I put her vehicle through the same kinds of tests I gave my Juke last week – sloppy steering, hard starts, traction tests, etc. The truck did just fine, but the driving experience was quite different. Unlike the Juke, switching the truck from two-wheel to four-wheel drive noticeably changes the feel of the ride and the steering, which get heavier and less smooth. The truck outweighs the Juke by almost 1500 pounds, and the whole thing is heavier, sturdier, and, well, more truck-like. 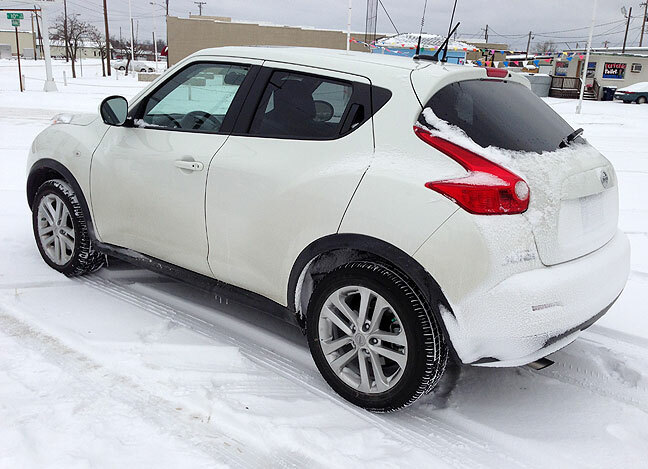 The Juke is better for shallow show, slush, sleet and ice. The Frontier is better for deep snow, mud, and off-road driving requiring high clearance. Abby arrives home tonight in her Nissan Frontier pickup. It has become a matter of routine for her coworkers to call when the weather is bad, since this truck is so sure-footed in the snow. One day I’d like to give it a try on some of the wilder roads in southern Utah, where I expect it would shine. The white on white is a good look.